This is a story about bicycles and pizza. It started with the plan to lunch at Miller Union–a restaurant that had been on my list from the get-go, especially with all the love Steven Satterfield’s been getting from the New York Times, Food and Wine, and countless bloggers and food critics. Even though the farm egg isn’t available for lunch, I figured any of the other dishes would do–I mean, who doesn’t want pulled pork or Sapelo Island clams (Sapelo, by the way, is my favorite island in Georgia)? But, somehow, I was derailed. I’m not sure what changed my mind–was it a review? A sudden lack of interest in Miller Union? The desire to bike a little farther than Octane, hit some other part of town (even if it was still West End)? Whatever the cause, I decided to give Antico a try. Yup, Antico, called the best pizzeria in Atlanta by many, but one riddled with complaints of rude servers, a “FLOSSING HER TEETH behind the register where pizzas and cannoli are handed to customers” (I found that one funny on Yelp), a crowded dining room with standing room only, etc. etc. But I’m all about the best of anything, so I gave it a whirl. I set off without really checking directions and, funnily enough, when you don’t live somewhere, it’s easy to forget where roads are. So I ended up stopping at Octane anyway to ask for directions, then pedaled down the hill towards the bottom of Georgia Tech’s campus. Antico itself is easy enough to find, and upon entering the cash register/pick-up area, I found the room open and light, the smell of baking dough wafting from the kitchen/dining room. I already knew what I wanted–the San Gennaro–so I placed my order and grabbed a orange infused Pellagrino to sip. I love places that only sell European drinks. Take that generic Coke! I have to admit–there were no crowds. Just me and a few late lunchers, some guy with an iPad gnoshing on a whole pizza, his crusts littering the tray, a couple or two, and some business guys who left soon after I arrived. The chefs were not super busy, but a few pizzas were being created–the dough guy gently massaging out the dough, the owner walking over and throwing dough in the air for kicks, one guy chopping vegetables on a back table, another folding boxes. I sat down at a large wooden picnic table that I had all to myself and, after only ten minutes or so, my beautiful beautiful pizza arrived on a stainless steel baking tray lined with brown paper. It’s the simplicity that counts sometimes. 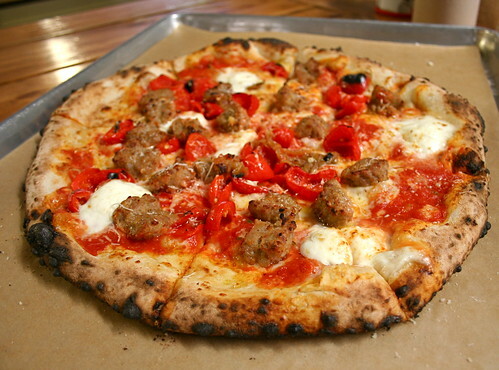 Let’s talk for a minute about the San Gennaro–crust, sauce, mozzarella, Italian sausage (with a fancier name than “Italian sausage,” of course), spicy calabrese peppers, and cipolini onions. If there was ever a perfectly balanced pizza, it is this one. Spicy and sweet and tangy and rich all at once, I’ve seriously never had a better slice. And the crust, of course, was the kicker for me–deep, fermented dough baked in these imported Italian pizza ovens to a perfect blistered perfection…oh heaven. I managed to eat three slices in one sitting–a feat, since the pies are huge–and then contemplated how to get the rest of the pizza home (you can only order one size here–their size). Maybe when the place is slammed, the servers and cashiers aren’t super friendly. But, at 2 pm when the lunch crowd is gone and it’s the afternoon slump, I had no problem explaining my issue and getting help from the cashier. 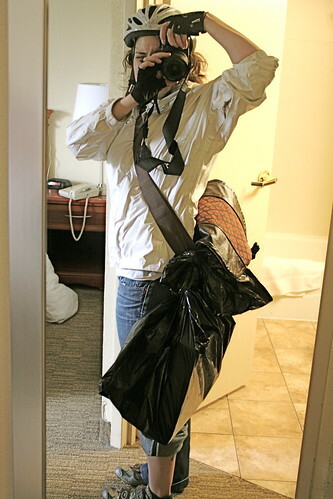 See, to cut down on ridiculous weight, I’d only brought my camera bag with me, not my giant messenger bag. I thought I could get a smaller pizza, so I figured it wouldn’t be a problem. And, as you can probably imagine, 2/3s of a pizza is not going to fit in a camera bag. So what to do when no handled bags are around? Ask for that my-sized black plastic garbage bag that all restaurants order from Sysco. Of course. The cashier definitely laughed at me when I left the restaurant, my cleats clipping the cement floor, a giant pizza box and kitchen garbage bag in tow. But I didn’t care, I was deliciously full. Staring at my bike, I rigged a way to carry the pizza three miles back to my hotel–insert pizza box in bottom of bag. Tie knot in bag at the box to keep the box in place. With leftover bag, tie around camera bag so that the bagged pizza box dangles at wheel/ankles. Pedal home and laugh at self while riding up very large hills and almost falling off bicycle. Celebrate upon arrival to hotel room. Take picture, then get mad because I didn’t think to ask the valet parking guy to take a picture of me with the pizza box in the bag with my bike. Oh well, you can’t think of anything. This review is all to say that, yes, Antico is by far the best pizza I’ve ever eaten in Atlanta, and, if you go at the right time, there are plenty of tables, tons of friendly servers and cashiers, and everyone even has a sense of humor. Though I must admit, I would love to go back one day in the evening to see the mad rush of people and bring my own wine or beer to drink with dinner. All my love to Antico. Love the pic, and totally agree that simple is best when it comes to pizza. Back in the A? Nice! I hear Miller’s has some vegan options. Is that true? Was just visiting back in May (during that amazing unseasonably cool week–couldn’t believe the awesome weather!). 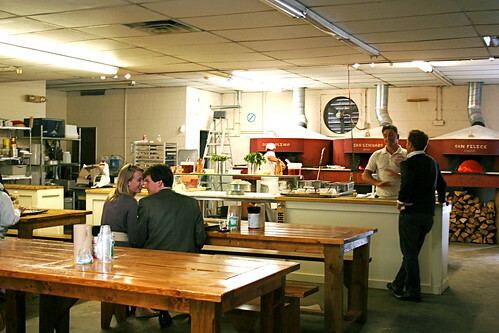 Miller’s does have vegan options–definitely call them if you plan on going to confirm, though, since the menu changes often. Ha! Glad you take take the leftover pizza with you. I hope you added a decent yelp review, too – I look at those and sometimes I wonder about the mix of good and bad. Man, now I’m craving pizza like nothing else, and there is absolutely NO decent pizza in this town. It’s pathetic. There are about 20 different pizza places, and they all make the crappiest, floppiest, cardboard-like crusts. I guess I’ll just have to start up a batch of dough asap! YAY! I have been missing your blog and wondering what you are up to. I am SO glad we reconnected. This pizza looks incredible. Pizza is one of those things that I always have to make myself because we don’t have many (any!?!) good restaurants around here. And bad pizza is the worst. It can be so exquisite so easily that to eat anything but is a profound disappointment. My taste buds cry. You are so right, sometimes simple is the best. Love the way you described this place, and your meal, and I admire your ingenuity – great pizza carrying strategy!